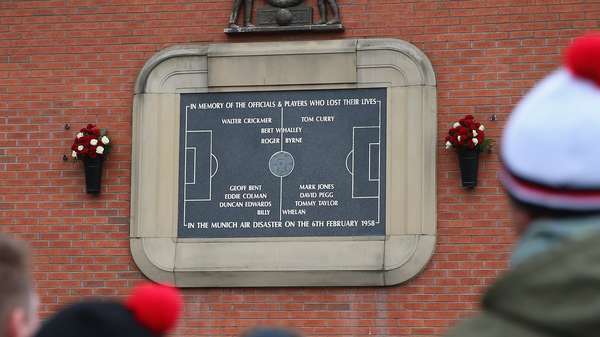 A former Newcastle United half-back who tragically died alongside several Manchester United colleagues in the Munich Air Disaster almost 60 years ago is to be recognised at a special event in Manchester on Sunday. Tom Curry, who played 235 competitive games for the Magpies between 1919 and 1929, was the Red Devils’ trainer when tragedy struck on the club’s return from a European Cup game in Belgrade in February 1958. Tom, who was aged 63, was one of 23 people to lose their lives. On Sunday 4th February, just two days before the 60th anniversary of the disaster, a Blue Plaque will be unveiled on the house in which he lived for 24 years with his wife, Elizabeth, and children, George, Thomas and Elizabeth. Located opposite St. Teresa’s School in Firswood, Manchester, it is just a short walk from Old Trafford. Tom's granddaughter, Jennie Dixon, and her sister, Liz Esser, will be unveiling the Blue Plaque at midday along with a special guest - and members of the public are also welcome to attend. Everyone at Newcastle United sends their best wishes to Tom’s family and those who knew him for Sunday’s ceremony. Born on 1st September 1894 in South Shields, Tom signed for Newcastle United in 1912 but saw his career delayed following the outbreak of the First World War. After serving as a sergeant with the Royal Engineers, his career resumed in 1919 and he went on to play in 221 league games and 14 FA Cup ties for the Magpies, scoring five goals. In 1929, just two years after Newcastle United had won the Division One title, Tom moved to Stockport County on a free transfer before hanging up his boots a year later. His off-field career as a trainer began immediately at Carlisle United in 1930 and after four years at Brunton Park, he moved to Old Trafford where he would spend 24 years as a loyal servant under managers Scott Duncan, Walter Crickmer and Matt Busby. Tom’s life was cut tragically short on 6th February 1958, when a plane carrying players, officials, diplomats and media from a European Cup match in Belgrade crashed at Munich Airport after a scheduled refuelling. Those who lost their lives are remembered in memorials in Munich and Manchester, with the Munich Tunnel beneath Old Trafford’s South Stand opened in 2008.